It seems that every family has a tradition on how they pass out presents. Maybe dad does it and you watch one person at a time open up and celebrate. Maybe the kids do it…maybe mom gets that honor. Maybe you wrap presents in a different paper for each person or maybe it’s utter chaos like it generally is in my house. And what about your youngest? I have a 4 year old that can’t quite read yet, but he has been able to be a part of the ‘passing out’ since he was 2. This year I devised a way to put him in charge where he will immediately know who the present belongs to…photo tag markers. 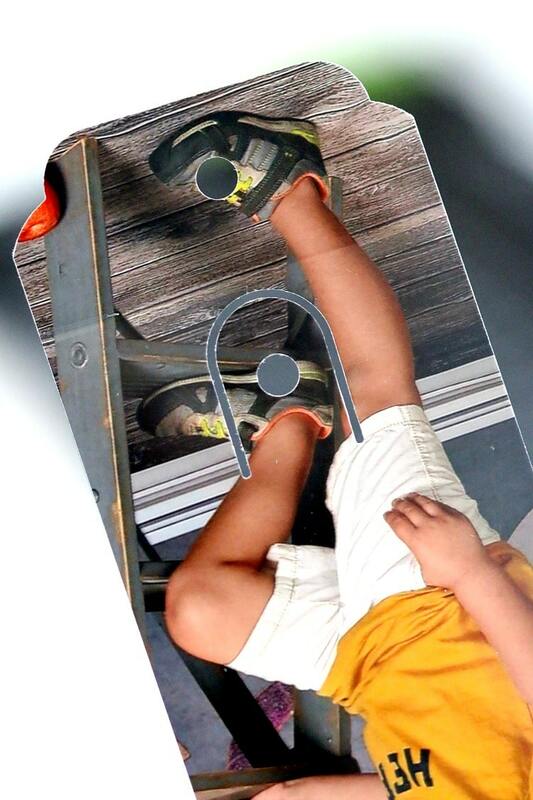 Creating tags with photos will help your child be able to identify who the present belongs to and bring it to them. But that’s not their only usage – You can also use these photo tags in a variety of other ways. 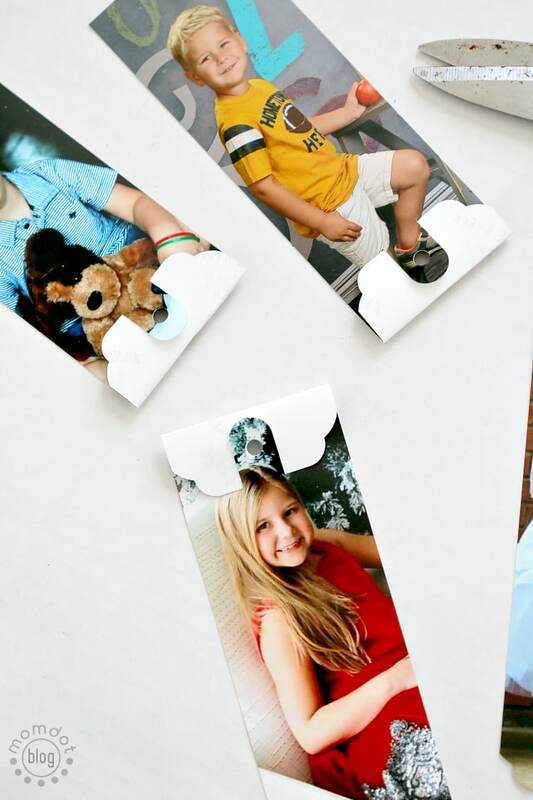 You can also use Homemade Personalized photo tags– in a variety of other ways. You can add a photo of the person the gift is to so you know when you pick up. 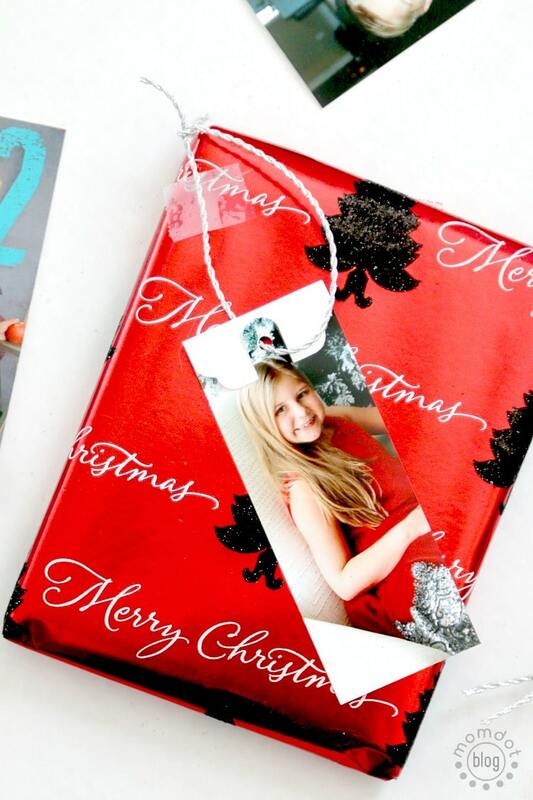 These tags are perfect for kids that cannot read yet to assist with passing out the presents! The will immediately know who to hand it to. You can add a photo of the person it was FROM so you know when you pick up. You won’t forget who to thank this way. Reuse them when done: the best part is that after the gifting is done, you can take them off the wrapping and hang right on the tree as a DIY ornament! Tag Hole Punch: Did you know they make a punch specifically for tags? Actually, they make hole punches for just about every situation and once you start going down that aisle in a craft store, you will never be the same. I picked up a hole punch that makes a variety of tag width sizes by We R. I loved this one because it has a really nice fold crease and a hole built into the tag to make for an easy string. It’s $19.99 on Amazon but I used a 40% off coupon at the craft store to save even more. You may be asking yourself why not just use a regular hold punch and you CAN but this one provides reinforcement with the way it folds and I like my stuff to last a long time. Prints – I had a partnership with CVS on a photo post and in so, had a TON of prints! You can grab your prints easily with SAME DAY printing so you can get this done today if you want! I also noticed a 30% off code right on their page so it’s a good time. And at only 19 cents a print (and then another 30 off), you can make a whole lotta tags today! Let’s get started on our personalized tags! First you need to have your photos ready. Like I said above, if you don’t have prints available, you can get those today at CVS. You just upload on their site to your nearest store and pick up. I printed 35 photos and then picked the ones out I wanted for this project. Now here is where you have a choice to make. You can either leave the photo backing, which will show on the fold over of the tag (and is fine with me) but it’s white and in some cases will have the brand of the photo on the back (like state Kodak) OR you can take the time to glue down some card stock before you trim so it’s colored. I didn’t do it for this demonstration, but going back I would probably just glue down some red and green cardstock on my photo backs before I got started. Let dry completely if you do this step. 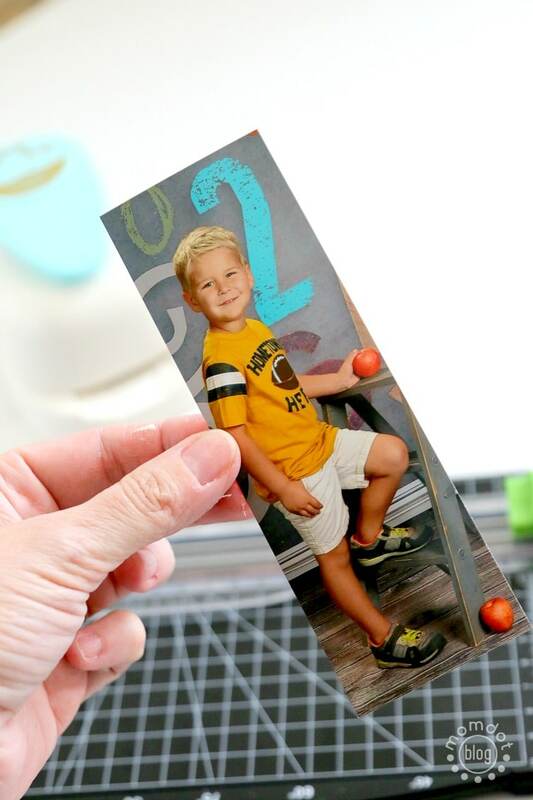 Once your cardstock is dry, trim your photo down to the width tag you are doing. 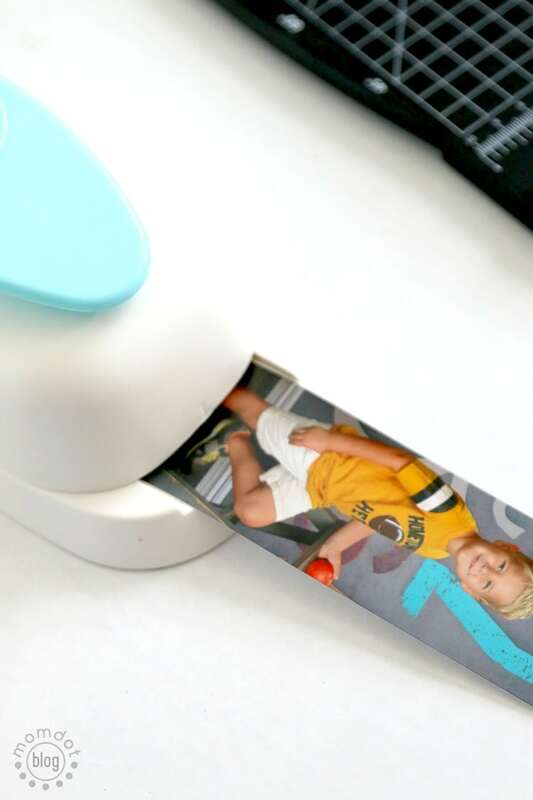 If you purchased the We R Tag Hole Punch, I lined up the image that I wanted on the tag and then used a paper trimmer to trim the sides down so it fit in nicely. Now decide which side to hole punch on, keeping in mind that there is a portion that folds down and may cover a head if not given enough room. Out of the hole punch, this one will have created a crease that you can fold and then interlock. As you can see on my demo, it’s white on that side from the photo paper. Again if you want to eliminate that, just glue and dry cardstock first. Now string up. Done! 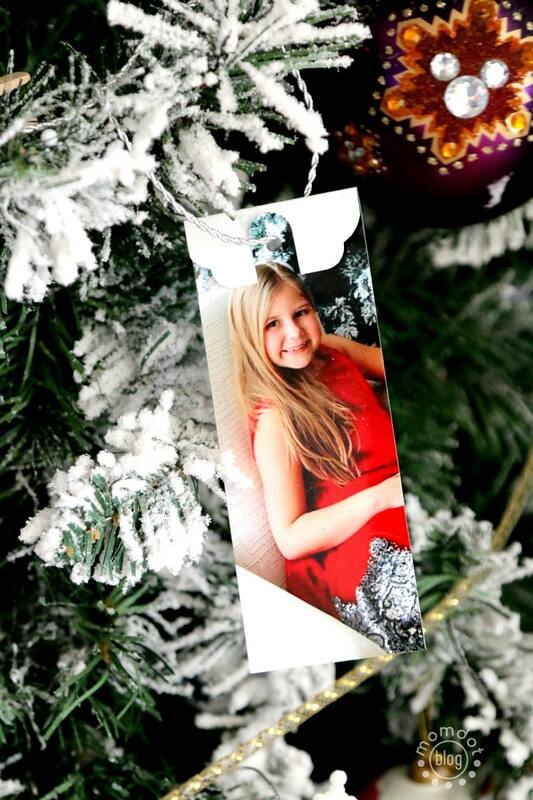 You can use these to mark gifts creatively and then afterward hang on the tree. If you want them to last for years to come, laminate and then hole punch the string area. They also make beautiful bookmarks. Make sure you take the time to come over on Pinterest and follow all of MomDots crafts, recipes and finds on my boards!